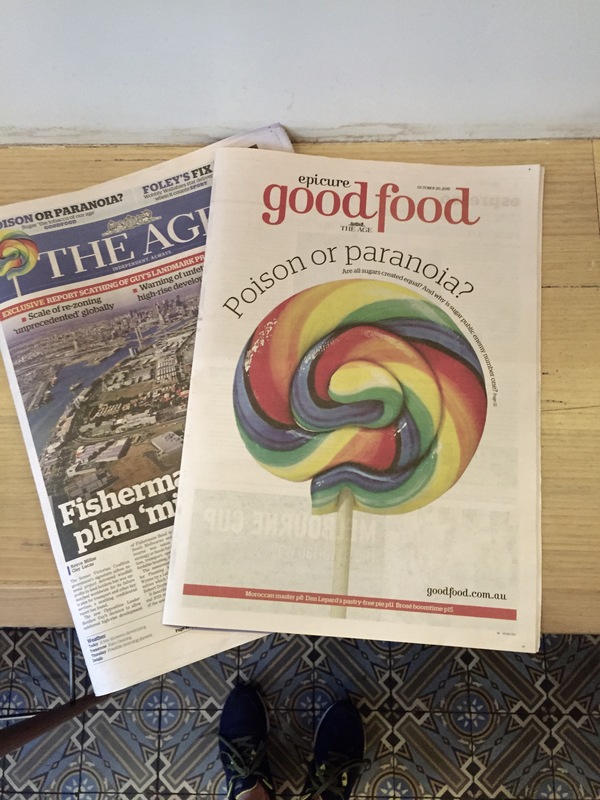 I waded into the sugar debate today with this cover story in The Age and the SMH’s Good Food sections. It’s beyond doubt that Australia has a problem with obesity, tooth decay and diabetes but to isolate sugar as the only culprit is of limited value, I think. Nevertheless, I’m more aware of the stuff now and find myself poring over nutrition panels to clock the sugars-per-100-gram amounts in products I’m buying at the supermarket. Do you? My big takeaway is again how important it is to cook at home using fresh, whole food ingredients. I’m not going to be obsessively measuring my daily sugar intake from now on (I think life is too short) but I’ll definitely be more aware of what I’m putting in my gob (and my children’s). You can read the full story at Fairfax Media here or scroll down to read it now. It was accompanied by a great interactive story on sugar alternatives and trendy sugars by Jane Holroyd, so be sure to check that out, too. My seven-year-old boy is active, not overweight and eats (a stealthily broadening list of) healthy foods. But he’s a sweet-tooth. Although we rarely buy fizzy soft drinks and generally keep a watchful eye on his sugar intake, the stuff just seems to find him. He’ll be walking down the street and stumble across an unopened packet of Skittles; butchers thrust jelly beans at him when we go shopping. Once, while idly gazing through the window of a local Thai restaurant, a waiter rushed out to hand him a surprise Chupa Chup​. We’ve come to accept this saccharine special power and don’t worry too much about it. We brush our teeth. But a spate of television documentaries linking sugar to alarming rates of childhood tooth decay, obesity and type-2 diabetes recently caught my eye. In Britain, Jamie Oliver is advocating a tax on sugary drinks (Sugar Rush), in New Zealand, Nigel Latta reveals food companies have been slipping cheap and “addictive” sugar into processed food for the past 40 years (Is Sugar The New Fat? ); and, in the US, there are claims that “Big Sugar” has been systematically burying the science that links it to all these chronic health issues a la “Big Tobacco” in the 1980s (The Sugar Conspiracy). 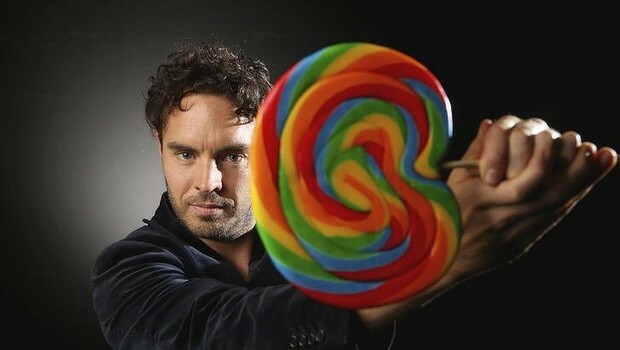 Damon Gameau, creator of the documentary That Sugar Film. So, what about here in Australia? On the doco front, actor Damon Gameau​ has been leading the anti-sugar charge with his That Sugar Film, a personal, quasi-scientific DIY experiment targeting hidden sugars in processed foods. But regardless of whether you think sugar is more or less to blame than fat or salt, there’s no denying we have an eating problem here. About 70 Australians a week are having feet amputated as a result of preventable diabetes-related complications, according to Jane Martin, executive manager of the Obesity Policy Coalition, a collaboration of leading public health organisations. Of course, sugar is not the only culprit. We need to watch fat and salt, too. But these nutrients have already been the subject of public campaigns. With the social and economic cost of type-two diabetes rising exponentially in Australia ($14.6 billion today, forecast to rise to $30 billion by 2025, according to Diabetes Australia) it’s time to put the sweet stuff in the spotlight. In March, the World Health Organization recommended people aim for getting less than 10 per cent of their total energy from sugars, translating to no more than eight teaspoons of sugar per day for men, six for women and four or less for children. But a 2012 report by Brisbane-based commodities analyst Green Pool* indicates an average Australian consumes more than a whopping 28 teaspoons per day. It’s not as simple as cutting sugar with your daily coffee, though. In processed foods, sugar pops up in plenty of unexpected places. Processing the concentrated sugars in freshly squeezed fruit juice can put your pancreas and liver under stress. Take low-fat yoghurt, the ‘pet hate’ of Professor Michael Cowley, director of Monash University’s Obesity and Diabetes Institute. To make this fat-reduced food more palatable, manufacturers often add sugar, he says. “I won’t call it dishonest, but it is deceptive to market it in a manner that suggests that it’s lower calories, which is really what matters: ’99 per cent fat-free’: you can endlessly define the world by what it’s not. From a public health perspective, there are some notable anti-sugar developments in Australia. Recently, LiveLighter (a joint venture from Cancer Council Victoria, the Heart Foundation, Healthy Together Victoria and the Victorian government) launched a television shock ad about the dangers of consuming soft drinks; meanwhile, the YMCA is in the process of banning sugary soft drinks (carbonated drinks and iced teas) from its 150 Victorian centres by this summer’s start, with sports drinks set to go by 2017. But consumers shouldn’t get bogged down singling out macronutrients, warns Professor Clare Collins, spokesperson for the Dietitians Association of Australia. “It’s all foods that are high in kilojoules, regardless of whether the kilojoules are coming from excess fat or excess sugar,” she says, adding that sugars occur naturally in many foods, such as milk. “If we got to the point where people are saying, ‘Oh no, I’m not giving my kids milk, I’m going to give them diet soft drink,’ well then that’s a disaster and a failing of our campaigns to try and promote a return to eating healthy whole foods that are going to give them the nutrients needed for good health. Bottom line from my view? Eat your fruit and veg. Don’t eat – or at least restrict – your intake of highly processed, engineered foods. The amount of sugar in foods varies naturally, but in some processed foods it can be higher than you might expect. We visited a supermarket with health campaign LiveLighter’s recommendations on sugar levels for food (less than 5g per 100g = “good”, 5-15g = “OK”) and drinks (less than 2.5g per 100g = “good”, 2.5-7.5g = “OK”). Here then, are our top-four unexpected ways you are getting your sugar hit (whether you like it or not). The kids are eyeing off a row of colourfully branded cereal boxes at the supermarket. One portrays a smiling bunny balancing a bowl of chocolaty ‘whole grain’ balls on its finger (Nesquik, by Nestle). The other calls itself the original protein cereal for iron men (Nutri-Grain, by Kellogg’s). For parents it’s a no-brainer, right? The ironman food every time. Wrong. It turns out Kellogg’s Nutri-Grain is 32 per cent sugars, which equates to every third spoonful you eat. , while Nesquik weighs in at 29.9g per 100g. Both are still way over the 15g bad side of OK.
(This week, interestingly, Kellogg’s has announced a sugar-reduced change to Nutri-Grain’s recipe, so watch this space.) But then again, Foodwatch.com.au’s Catherine Saxelby says the rule doesn’t work so well for cereals that contain dried fruits, where a maximum of about 25 per cent sugars is more reasonable. Part-preservative, part-naturally occurring in tomatoes, sugar is a big reason why your bangers taste so good with dead horse. Per 100g of the supermarket tomato sauces we compared, Masterfoods was the most sugar-free (18.5g), followed by Fountain (24.8g) and Heinz (25.8g). Barbecue sauces were far sweeter, however, with Masterfoods Barbecue sauce clocking in at 54g. Watch out for prepared tomato pasta sauces – they often contain far more sugar than is natural or you would add if you were making it from scratch (for example, Dolmio Classic Tomato pasta sauce has 7g of sugars per 100g). Also, we found some high-in-sugar cooking sauces too: Masterfoods Teriyaki (36.5g), Fountain Hoi Sin (32.4g), Masterfoods Satay (21g) and Maggi Premium Oyster Sauce (32.2g). Just because something is freshly squeezed, doesn’t mean it’s automatically good for you. While there are valuable vitamins in fruit juices, when consumed in excess, the concentrated sugars can put your system – particularly the pancreas and liver – under immense stress. Drinking a cup of orange juice will give you a big sugar rush. When you eat an orange it takes longer, you eat roughage and ultimately fewer sugars are metabolised over a longer period. “When I last checked there was more sugar in commercial orange juice or Boost Juice than there is in Coca-Cola,” says Monash University’s Professor Michael Cowley (Coke has the equivalent of nine teaspoons of sugar in a 330ml bottle). No nuts, something that will survive unrefrigerated, something healthy that will get eaten: what to stick in your kid’s daily lunchbox? Professor Anna Peeters​ says typically people have no idea how much sugar is in daily foods like lunchbox snacks. Our quick supermarket check found Kellogg’s LCM Split Stix (34.2g), Weight Watchers Macadamia & Cranberry bars (28.5g) and Uncle Tobys Fruit Roll-Ups (30.3g). Another schoolyard culprit is fruit drink poppers, which are typically high in free sugars. Nearly all sugars contain fructose. Fructose is found naturally, for example in fruits, but when we get frequent, high doses, without fibre to slow it down, it becomes a problem. Unlike other sugars, fructose is processed exclusively in our liver. Small amounts, like eating an apple, are fine. But when we consume it in concentrated levels, the liver gets slammed. It does what it can – transforming the fructose into fat. Some of that fat gets deposited around the mid-section and internal organs but sustained exposure can ultimately result in fatty liver disease and non-alcoholic liver cirrhosis. Sugary drinks: public enemy number one? Sugary drinks have been under particular fire in recent months, with Jamie Oliver advocating a tax in the UK and a television shock ad just launched here in Australia. Part of LiveLighter’s anti-sugar campaign includes a poster on sugary drinks that includes some damning facts including: drinking one can of soft drink a per day leads to an estimated 6.5kg weight-gain in a year (you’ll also spend $1035); there are about 16 teaspoons of sugar in a 600ml bottle of regular soft drink; and that Australia is in the top 10 countries per capita for the consumption of sugary drinks. However, the Australian Beverages Council says if you lead an active lifestyle with a balanced diet you can include foods and drinks containing sugar in moderation. “To single out sugar-sweetened beverages as a leading factor of chronic disease oversimplifies a complex public health issue and misleads people to ignore the concept of the total diet,” says chief executive Geoff Parker.